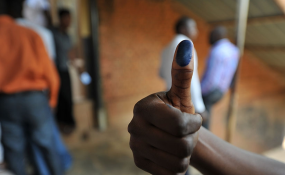 A voter shows his thumbs with ink after voting. The information is contained on the commission's verified Twitter handle @inecnigeria. It stated this in response to what it described as 'fake news' that voters could only vote with a particular finger. A message on Whatsapp, Facebook and Twitter had read, "INEC has changed pattern of voting without majority of citizens being aware o! You don't vote with your thumb anymore. "You vote with your index finger (warning finger). Any vote cast with the thumb is void. My question is why were the citizens not sensitised before now? "Why would INEC hide such important information till a few days to the election? Please, don't only read this, share for many would-be voters to be aware. The Destiny Of This Nation is now in our warning or prophetic finger." But INEC said, "voters can use any finger on the ballot but should ensure that the mark is clear and placed in the box of the political party of their choice and does not stray into another box." "Nigerians should go to the polls on Saturday, confident that the electoral process will be upheld based on our laws and constitution. "We are pleased with the signing of the National Peace Accord today and look forward to all parties honouring our shared commitment," they stated.